It would have been so easy to stop running after the initial wave of energy after participating in a memorial run in January 2014 in honour of Meg Menzies, a runner who was hit and killed by a drunk driver on a training run for the Boston Marathon, but for some reason I kept going. Knowing me, however, I would need a bit of incentive to push through on the days that I wanted to stop. When it just seemed too hard, too boring or too much for me to handle. That was when I heard about IRun4, a group that pairs (virtually) a person with disabilities to a runner. The runner then dedicates their miles, workouts and efforts to their buddy. It all started with one person, Tim Boyle, who started running for a Facebook friend, a 50-something man with Downs Syndrome, who said Tim could run for him anytime. In only two years, the group has made more than 10,000 matches and continues to grow. In fact, the group has a waiting list of more than 3000 runners who want to be paired with a buddy, and it seems that the list gets longer every day. In June 2014, after much thought and deliberation, I registered to be a runner in this group. I wanted to make sure that I would be in it for the long haul, not want to quit when I got bored or things got too busy/difficult. After all, it is not really about the miles someone runs; it is all about the relationship you develop with your buddy, and in many cases their family. Many runners have the chance to get to know not just their buddy through the Facebook posts and messages they send back and forth, but they also learn about so many disabilities, diseases and what it is like to fight and push through those challenges. 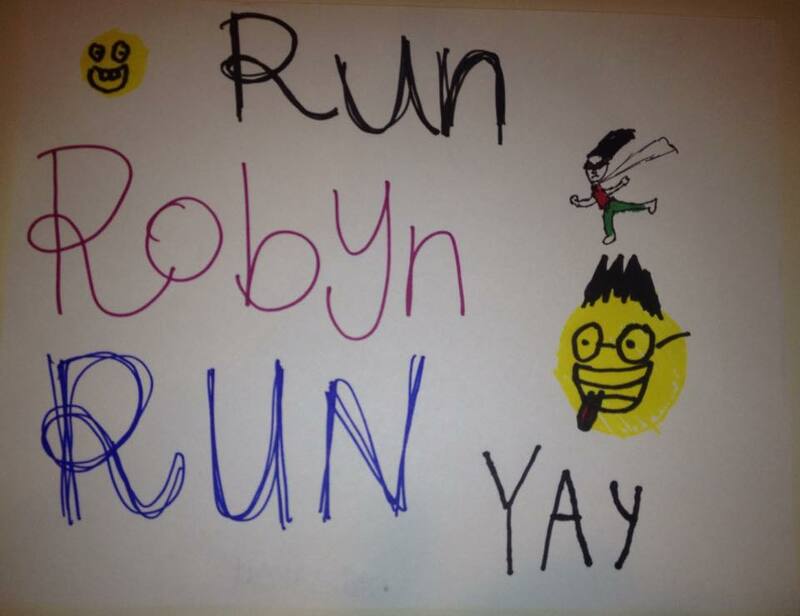 They watch their buddy (and the families) struggle with more tests, more surgeries, more difficulties–and occasionally see their buddy gain their angel wings–and it helps them to run further and faster than they thought possible. When you can’t be there to offer support, you can offer your steps, which are a runner’s prayers for their buddy. I was ready to take the plunge. I started on the wait list at about 3100, with a 4-6 month wait time to be matched. Wow. Every week a notice was sent out to update the wait list and I eagerly saw my number drop between 100-200 spaces on the wait list each week. Which was fast, but certainly would still take a while to meet my buddy. I just had to learn a lesson in patience. It would be worth it in the end, I kept reminding myself. Then in July, a new group was formed. One for the siblings of the kids with special needs. Often, the siblings serve as caretakers, advocates, protectors and helpers of their brothers/sisters with special needs. They have to grow up more quickly, have their needs and wants put on hold when their siblings’ needs take precedence and sometimes need a special thing that is all their own. And with a wait list a mile long of runners, this was a great way to help honour the ‘unsung heroes,’ the siblings, by matching them with their very own runner. As a very impatient person, I jumped on this, and within a day, I was matched with my sibling hero buddy–Kiernan. Kiernan’s brother Nick is in the main group (and has a fantastic runner, Twyla, whom I have met when visiting New Orleans). 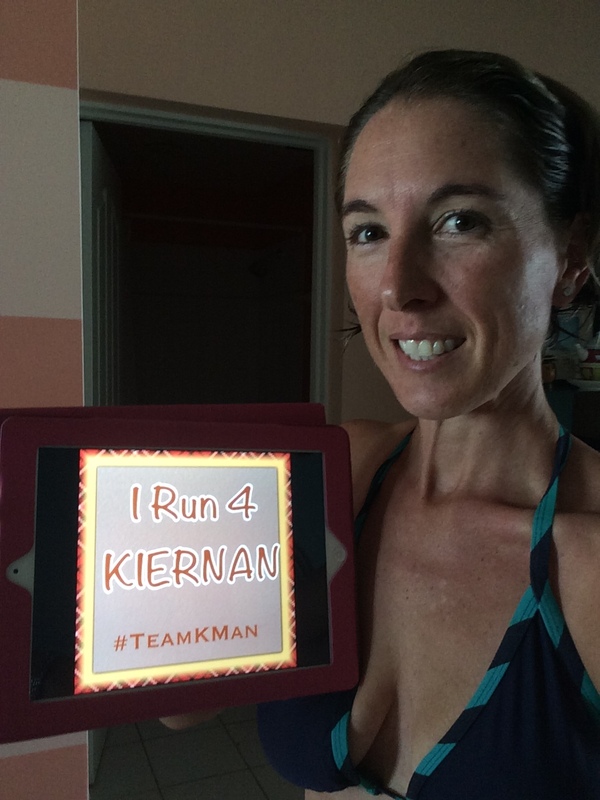 His sisters call him the K-Man, and the way we say ‘Cayman’ on island is more like ‘Cay-MAN’ it meant that our team had a natural name–Team K-Man! 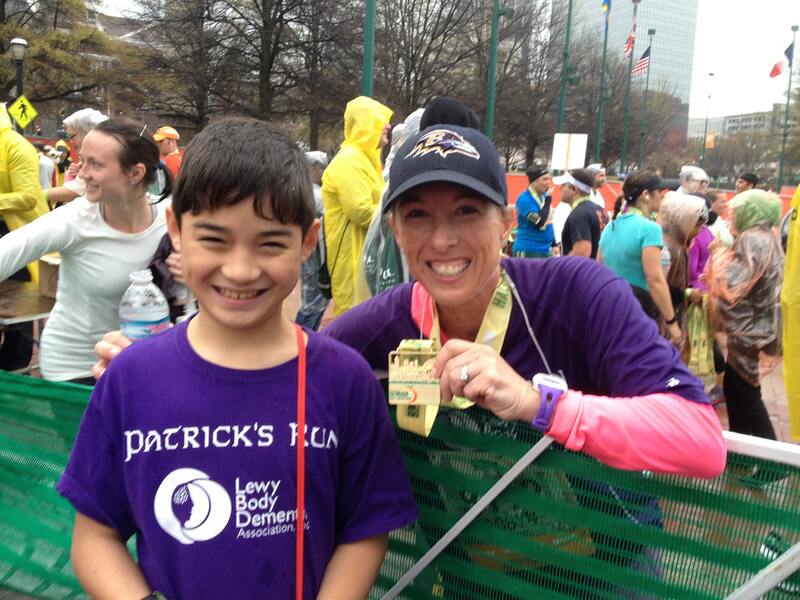 Kiernan was 10 years old when we were matched (he turned 11 in March 2015), and I had the amazing experience to meet him only days before his 11th birthday, when I ran the Georgia Half Marathon. 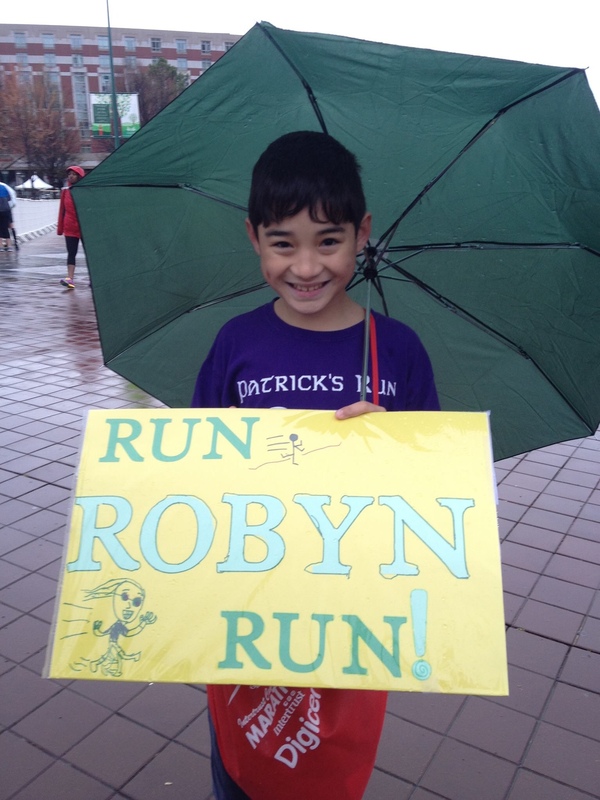 It was a rainy day, and he and his family stood out in the rain to cheer me on and meet me at the finish line. I was so blessed to have that moment with these people–people I likely would never have met if it weren’t for IR4. Kiernan is a great brother to Nick (and his sisters), is super smart, loves to tell corny jokes, and like many young boys, loves his video games! I try to post to him several times a week (if not every day) to let him know how our training is coming along. It was being his buddy that inspired me to register for my first half marathon in Baltimore. 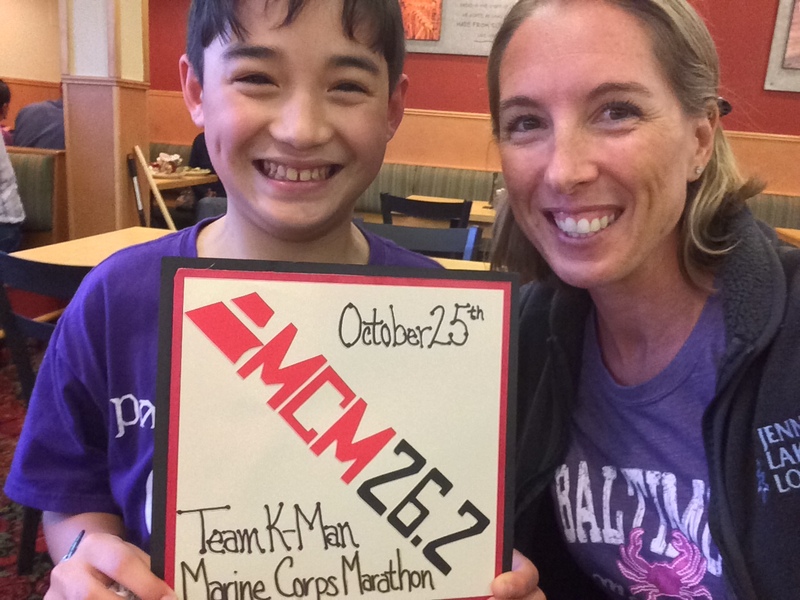 And I want to keep going for him, so I decided Team K-Man, was ready for the challenge of 26.2, a full marathon! I was so excited to tell him in person when I met him and his family. Every race, he makes me a sign that I then print off and have in my fuel belt for encouragement. His family tracks me when there is virtual tracking of runners on the internet. I send him a medal or a shirt from every race that I run, so he can also have some of the fun of the race experience. Together with his dad, he made a medal rack where he proudly displays the medals in his room. I was so happy to see it. You see, sometimes I just want to stop running. It would be so easy to do so. No one would ever know. But now there is someone who does know. Someone who wants to hear about where I run, what I see, what animals I might come across, when my next race is, what cool medal I will earn next…and I know that I don’t want to let him down. I want to show him that you don’t always have to be the best at everything, but you need to try and try your hardest. That you need to work for the medals. That sometimes you try and you just need to throw in the towel. That you also then have to get back out there and try again. And that no one wants you to fail–that your friends and family want to cheer you on to success, that it’s all worth it in the end. If I can help to inspire him a fraction of how he has inspired me to push my boundaries beyond the comfort zone, then all the miles, the lost toenails, the sweat and tears will all have been worth it. 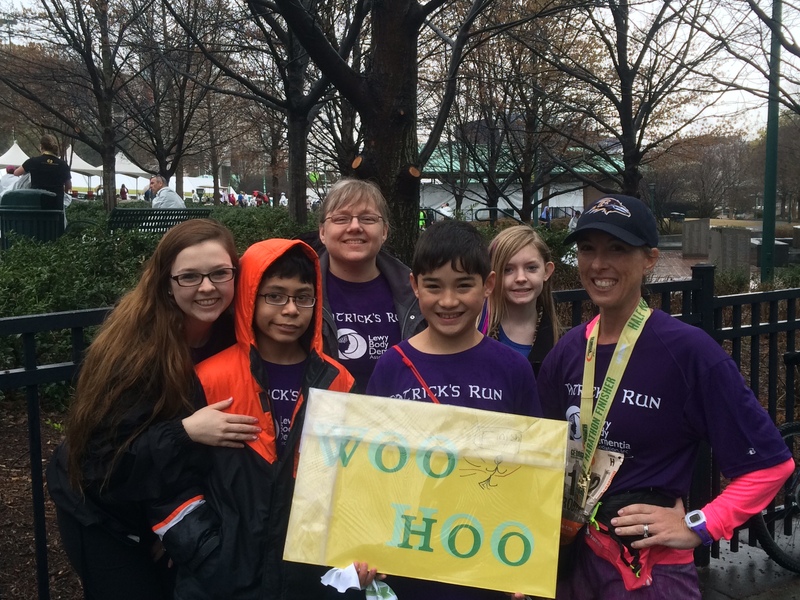 My cheering squad stood in the rain to see me at the finish line! Aren’t they amazing?